If you love to cook, these smart tech kitchen appliances will take your cooking to the next level. Do you hate it? They will make your life that much easier. Check out the list of 7 smart tech items that will help you cook better, faster and healthier while keeping you informed and organized. 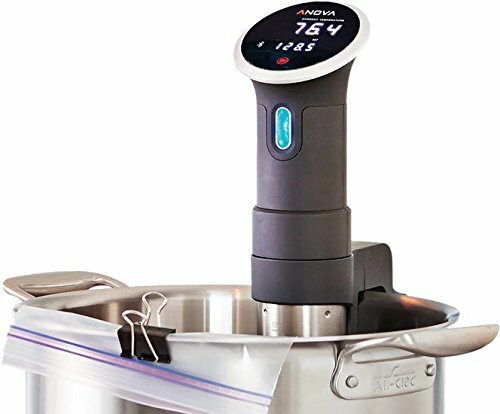 The Anova Precision Cooker makes cooking pleasant even for those who absolutely hate the activity. You simply attach the device to your pot, put your food in a sealed bad, and set the time and temperature. That’s it. The Precision Cooker then circulates water inside the pot while maintaining the temperature at a set level, which means food does not overcook. By connecting it to your phone via bluetooth you can monitor the process while watching your favorite show. The device works with any pot, so you don’t need to purchase any additional items. While pan-frying or grilling food means you lose some of the natural food flavor, sealing it in a bag results in all this flavor and nutrients retained. There are no dry edges and no rare centers. Range is a precision food thermometer that plugs into a phone or tablet to provide temperature graphs and instant readouts. Food-safe silicone and stainless steel mean that Range can hang with any utensil. The handle clips onto pots for hands-free cooking, and the 4.5’ silicone cable is tough enough to stick in the oven. You can have alerts sent directly to your phone, although it is limited to iOS devices at the moment. Range comes with USDA- and gourmet-recommended presets for meat and candy as well as Fahrenheit and Celsius scales. 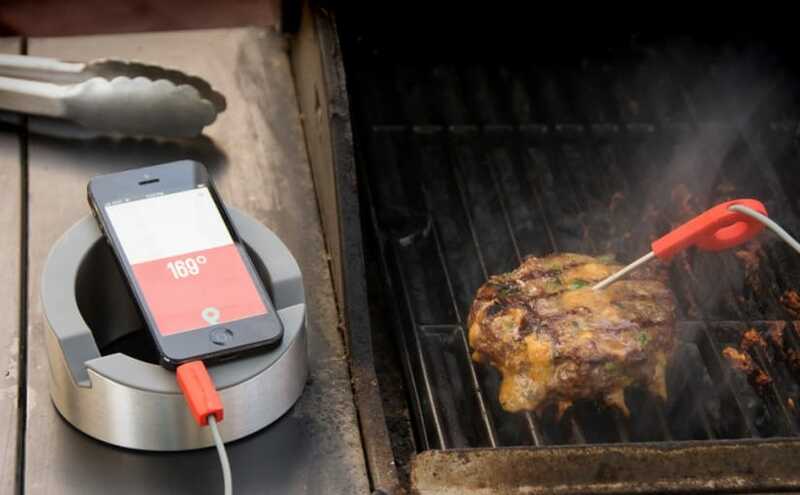 This smart tech product will make steaks or Thanksgiving turkey come out perfectly. It can be used for grilling, roasting, candy making and homebrewing. How often do you stop by the eggs section in a supermarket while doing groceries wondering if you have enough eggs in the fridge or if you should buy a dozen “just in case”? Even if you know for a fact that you have a couple of eggs in the fridge, do you remember when they were bought and how fresh they are? This smart tech will solve the problem once and for all. 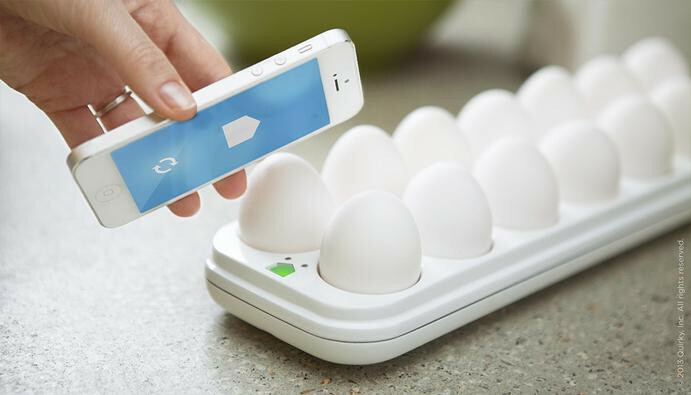 Egg Minder keeps track of up to 14 eggs and, with the help of LED lights and an app for your phone, it will let you know how many you have left and which ones might be going bad. You can also set up alarms, so you get a notification when you are running out of eggs. 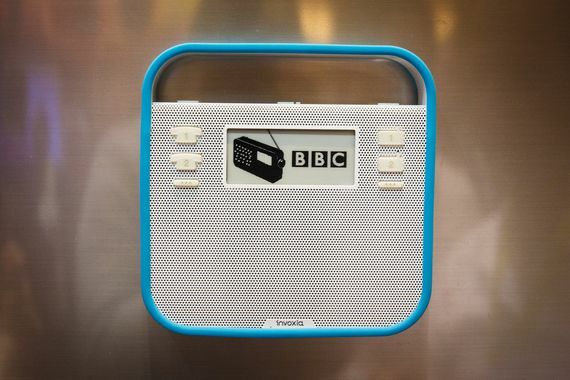 Wireless speakers + FM Radio + notes + VoIP calls = Invoxia Triby. It’s a smart tech device that you attach to your fridge. You can send messages, emoji and hand drawn doodles to Triby ’s E-Ink display if you forgot to leave a note on the fridge while at home. Either select one of the 27,000 online radio stations or connect the wireless speakers to your laptop/tablet while cooking. Triby’s microphones work with the speaker to turn Triby into a hands-free speakerphone allowing calls to be made over VoIP or with paired smartphones from up to 15 feet away. With a recent addition of Amazon Alexa integration, you can also control it via voice commands. Wake up and smell the coffee! This device is for people who like their coffee just right (and at the right time). You can grind and brew fresh coffee beans automatically or on demand. 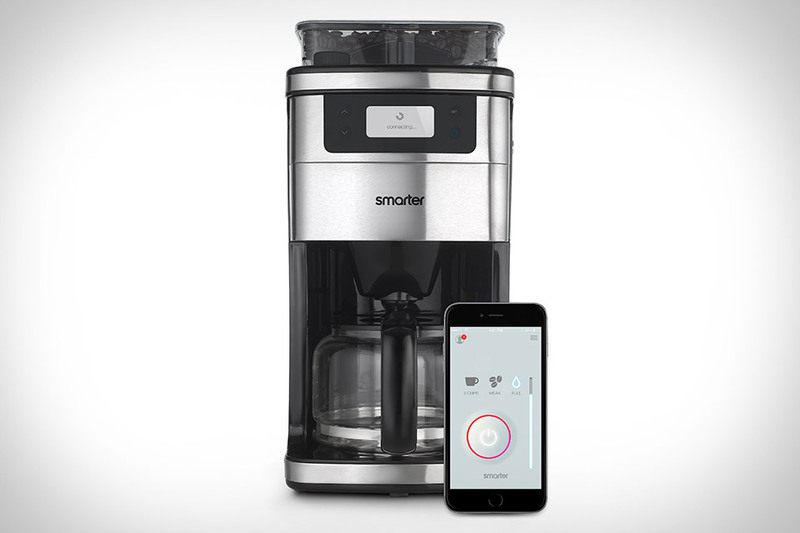 Smarter Coffee not only gives you the option to decide how coarse your beans are ground, but also lets you choose the strength of your coffee. Did your Fitbit notice that you didn’t get proper rest at night? Your morning coffee will be stronger. You can brew a single cup or up to 12 with this smart tech product with a 1.5 litre capacity. It comes with 3 interchangeable panels to match your kitchen decor – black, beige and red. Do note, however, that Smarter Coffee comes with a 3 pin UK plug only, so you’ll also need to purchase an adapter. This is a high-tech fridge of the future. While by far the priciest item on the list, LG ThinkQ will definitely increase the IQ of your kitchen. You will receive alerts on your smart phone when it’s time to replace your refrigerator’s fresh air filter and water filter. One of the best features of this refrigerator is the 8-inch Wi-Fi LCD screen. 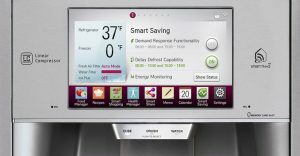 The touch screen serves as both a control panel for the refrigerator as well as an information hub. You can Scan a grocery receipt with your phone and it’ll create an inventory list, or enter your height and weight and it’ll recommend recipes based on what foods you have and how healthy you are. Do you prefer freshly squeezed juice as opposed to coffee in the morning? Not a problem. There’s smart tech for you as well. 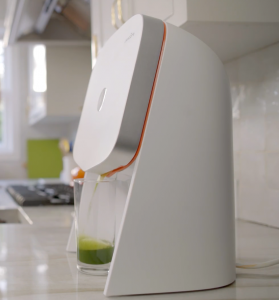 Juicero is a personal cold-press juicer that’s engineered to press nutrient-dense, raw produce into a glass in minutes. Keep in mind, however, that you would need to order Juicero packs to use this machine.On the bright side, the wide range of packs will ensure that you will find something for your specific tastes: carrot beet, spice greens, sweet roots, beta glow – all from organic fruits and vegetables. The produce – completely raw and unpasteurized – is that sealed in a bag and shipped to your door.